So you’ve decided that dental implants in Fort Worth are the way to go for your new smile. Once you go through the process and walk out the door after treatment, you’ll be amazed at how much dental implants feel like natural teeth. They feel so real that you’ll forget that you even have dental implants! As long as you care for them daily, they can last for decades and even a lifetime. So without any further delay, let’s explore the treatment process. Before any surgery can begin, your dentist will need to determine that you are eligible for implants and if so, create your treatment plan. This involves taking X-rays, discussing the various implant options he offers, and create a surgical plan. This way, there are no surprises the day of surgery. If your dentist does not place the implants, he’ll refer you to a trusted surgeon offsite to have your implant placed. When you arrive for your surgery, you’ll be given local anesthesia or a form of sedation to make the surgery as comfortable as possible. Then, your implant dentist in Fort Worth will open the gum tissue, place the implant, and seal the area. Like any other dental surgery, you’ll have to let the area heal over a set period of time. Dental implants typically require between three and six months to fully heal. Be sure to avoid using any tobacco products as this can slow the healing process. This also allows the implant to undergo osseointegration, a process where the implant physically bonds with the jawbone. After the healing and integration is complete, you’ll come back to have your abutment placed. The abutment is the connector between your restoration and the implant. Once placed above the gumline, you’ll give your gums a few more weeks to heal. Once the area has fully healed, you’ll come back to the office to have impressions taken. These will be used to produce your porcelain crown. It will be shaded and shaped to match the rest of your teeth exactly, so you won’t have to worry about it blending in. As a bonus, this crown cannot develop decay. With that being said, you’ll still need to practice daily oral care and visit your dentist every six months for cleanings and examinations. 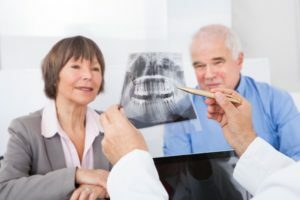 These periodic checks will also give your dentist the chance to confirm the implant is in good condition and that your at-home care is up to par. Reap the benefits of dental implants in Fort Worth by scheduling an appointment with your dentist today! Dr. John G. Boyd is fully qualified to make implant-retained restorations that blend in perfectly with your smile. After earning his Doctor of Dental Surgery degree, he went on to become a member of the ADA, the American Academy of Cosmetic Dentistry, and the Texas Dental Association. To learn more about his practice, contact him through his website.